The piriformis is a difficult-to-reach muscle that runs from your spine to the femur (thigh bone). When it begins to push against your sciatic nerve, often due to sitting too long, it can cause excruciating pain. A tight or inflamed piriformis is what is known as piriformis syndrome. Piriformis syndrome is an entrapment or compression neuropathy that can result in pain, numbness, paresthesias (burning or prickling sensation), and associated weakness in the distribution of the sciatic nerve. Piriformis syndrome is caused by compression of the sciatic nerve by the piriformis muscle as it passes through the sciatic notch. The piriformis muscle’s primary function is to externally rotate the femur at the hip joint. The piriformis muscle is innervated by the sacral plexus. As the femur is internally rotated, the tendinous insertion and belly of the muscle can compress the sciatic nerve; and, if this persists, cause entrapment of the sciatic nerve. Symptoms often begin as severe pain in the buttocks, which may radiate into the lower extremity and foot. Patients suffering from piriformis syndrome may develop an altered gait, which may result in the development of coexistent sacroiliac, back, and hip pain, which can obfuscate the true clinical picture. 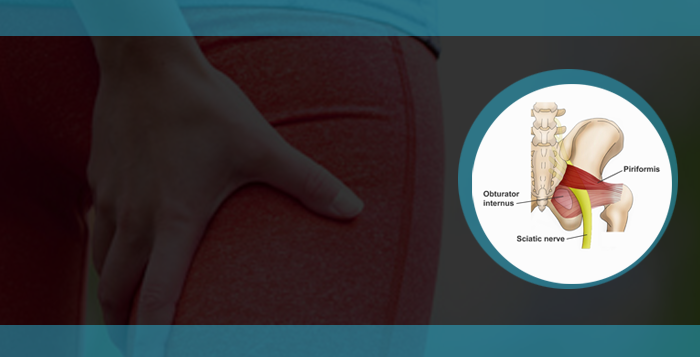 Untreated, progressive motor weakness of the gluteal muscles and lower extremity can occur. The onset of piriformis syndrome symptoms usually occur after direct trauma to the sacroiliac and gluteal region; and occasionally, as a result of repetitive hip and lower extremity motions or repeated pressure on the piriformis muscle and underlying sciatic nerve. How to stretch the piriformis muscle? a. Lie on your back with both feet flat on the floor and both knees bent. Pull the right knee up to your chest, grasp the knee with the left hand and pull it towards the left shoulder and hold the stretch. Repeat for each side. b. Lie on your back with both feet flat on the floor and both knees bent. Rest the ankle of the right leg over the knee of the left leg. Pull the left thigh toward the chest and hold the stretch. Repeat for each side. Each piriformis stretch should be held for 5 sec to start, and gradually increased to hold for 30 sec, and repeated 3 times each day. a. Stand with your back against a wall and walk your feet forward 24 inches. Position your knees over your ankles, and then lower your hips 45 degrees toward the floor. b. Lift your right foot off the ground and place the outside of your right ankle on the floor. c. Lean forward and lower your chest toward your knees while maintaining a straight back. d. Hold for 30 to 60 sec, then switch legs and repeat. a. Lie on your back and bend your right knee. b. Use the left hand to pull the knee over to the left side, keeping your back on the ground as you do so. You should feel a stretching sensation in the hip and buttocks. c. Hold the stretch for 20 to 30 sec, repeat 3-5 times, and stretch 3 times a day. a. Sit on the floor and stretch your legs straight out, as far apart as is comfortable. b. Tilt slightly forward at the hips and place your hands next to each other on the floor, about a foot in front of your torso. c. Lean forward and drop your elbows to the floor. You should feel a stretching sensation in the pelvis. d. Hold for 10-20 sec, then release. Pause and repeat. a. 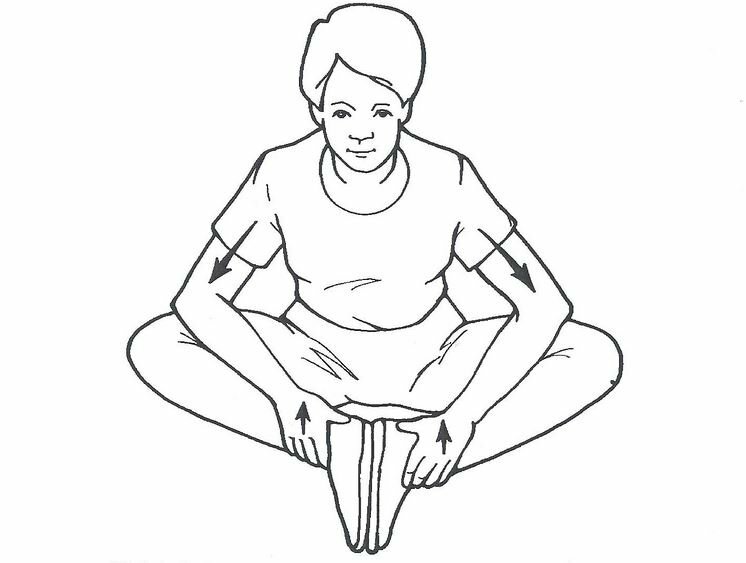 Sit on the floor and place the soles of your feet together. b. Apply a downward pressure on your knees by using your elbows to increase the stretch. c. You should feel a stretching sensation on the inside of your thigh. For a deeper stretch, lean forward, keeping your back straight. 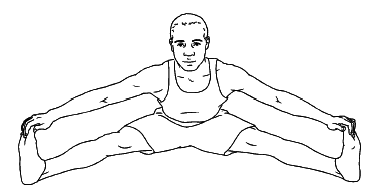 d. Hold this position for 30 sec., slowly release, then flutter your legs for 30 sec. e. Repeat 3-5 times in a row and stretch 3 times a day. General piriformis, piriformis muscle, piriformis muscle stretching, piriformis stretching, piriformis syndrome. permalink.